Satu Mare (German: Sathmar, Hungarian: Szatmárnémeti) is the administrative centre of Satu Mare county. The city is located on both sides of Someş River, approximately eight kilometres from the Hungarian border. The settlement of Satu Mare emerged on the left shore close to a fording and a fort. The fort and the subsequent granting of city rights was for many years the most important factor in the region’s development. The first documented evidence of Satu Mare stems from the rule of King Stefan III (1162-1172). On the right shore of Someş River, Minitiu (Hungarian: Németi) is located. It was settled by “German guests” who had been recruited by Queen Gisela, wife of King Stefan. This can be read in a document from 1260. The German origin of the settlement is also reflected in its name: in 1268, it is recorded as Nympti and Nepti, which means “the Germans” and “belonging to Germans”. First evidence of the settlement is given in 1230 in the context of a royal privilege, which explicitly mentions the “hospites Theotonici de Zathmar nemethi iuxta fluvium Zomus residentes”. In the early 18th century, the two towns became one and gained privileges as a royal free town in 1715. The population, which had fled after the Kuruc wars, was returning to their home towns. Numerous floods and epidemics hindered the city’s development. In 1769, 5.000 inhabitants remained. Well into the 19th century, the city maintained a rural character. Representative buildings could not be found and the streets were unpaved. The majority of houses were made of clay and wood and covered with shingles or straw. The city’s development saw a boom after the establishment of the Roman-Catholic diocese of Satu Mare in 1804. Several buildings were erected or restored and the Roman-Catholic Church’s influence on Satu Mare gaining city rights was quite obvious. When János Hám was bishop, the Roman-Catholic cathedral and the bishop’s palace was finished, a calvary church erected and a monastery of the sisters of misericordia was built. At the end of World War I, Satu Mare and most of its county were given to Romania. During the interwar period, many buildings were constructed: the Roman-Orthodox and the Greek-Catholic church as well as the prefecture building which now holds the county museum. Today, the city is headquarters of the Democratic Forum of Germans of Satu Mare County. Furthermore, an association for international cooperation, which is run by the German minority, operates from Satu Mare. The association was founded in 1991 and supports small and medium-sized businesses in the areas of agriculture, crafts, trade and service industry. The German High School Johann Ettinger was founded in 1997. The school that holds all classes in German has over 600 pupils from all ethnicities of Satu Mare. 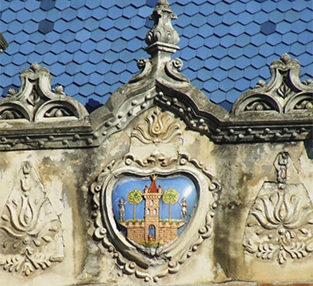 Satu Mare’s crest on the facade of Dacia Hotel. 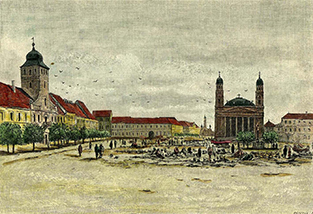 Satu Mare’s main square with it cathedral in 1889.